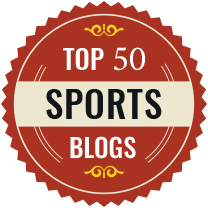 This post is actually a continuation of a discussionhappening on the DiscussFastpitch forum. I was trying to make a point over there, but I needed pictures to show it. Couldn’t figure out how to put them up there and so I tried doing it with Facebook. But you have to have an account with Facebook to see them, apparently, and since most adults don’t that wasn’t the answer. Then it hit me. I have a blog. Duh! Notice the green lines, that trace his forearms. They are forming an upside-down V. The back elbow will elevate some as he goes into launch, but this is where he’s starting. Like this or not, you can’t argue with the results! Posted on May 23, 2008, in Hitting. Bookmark the permalink. 5 Comments. Here we go again. It seems like we have gone through this before. Whether the elbow is up or the elbow is down I guess depends a lot on what a person calls up or down. When I look at Pujols I see elbow up, you see elbow down. I call it elbow up because the elbow is pretty much even with the shoulder, not even with the mid torso. I also call it up because the upper arm is pretty much parralel to the ground, not at a 45 degree angle. Yes, here we go again. The only reason it appears his back elbow is raised is because his hands are so high. If you brought his hands down to his shoulder or armpit, his back elbow would be by his torso. To me, the back elbow being up is if the hands are at the shoulder or armpit and the elbow is parallel to the shoulder, upper arm is parallel to the ground. It would then be raised on its own. Pujols’ elbow is up because it’s attached to his forearm, which is attached to his hands. No other reason. You state – “The only reason it appears his back elbow is raised is because his hands are so high. If you brought his hands down to his shoulder or armpit, his back elbow would be by his torso.”Not true. He does bring his hands down to his shoulder and his elbow doesn’t move. Look at the second photo again. This is after he loads but just prior to launch. 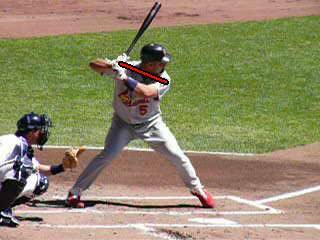 Hands and elbow are both at the shoulder.You state – “Pujols’ elbow is up because it’s attached to his forearm, which is attached to his hands. No other reason.”Not so fast Ken. I think there might be another reason. The important thing is to have free and independent hands. 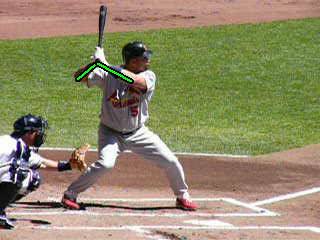 Back elbow needs to have some room to lead the top hand through as in a rock skipping motion.You don’t want the back elbow too high or it has to travel down a long ways before any movement of the hands/bat to the ball. Wasted movement, slower reaction.Also important, his front shoulder and bottom hand wrist are cocking. He will unload shoulder, elbow, then the wrist. Doug,I tend to agree with some of what you said, but not all. Unless I’m misinterpreting you, I wouldn’t want the back elbow to lead the hands at any point in the swing. That would create a weak hitting position, and the dreaded bat drag. Can you explain what you mean about the back elbow leading the top hand? Maybe I’m misunderstanding.